The Beauty of Red Roses: Shu Uemura Haul!! Today is officially the start of the David Jones Half Yearly Clearance! I walked through David Jones during my lunch break today and there were a few Shu Uemura cosmetics and skincare products that were discounted to 30% off rrp. I've never come across discounted Shu Uemura products before, so I took this chance to purchase some amazing Shu Uemura goodies! I absolutely love and admire Shu Uemura's creative and attractive range of false eyelashes, though I've never tried them on myself as they're quite dear to own a pair! Shu Uemura is known as the 'Art of Beauty' with huge sucess in the beauty industry. Some of Shu Uemura's 'beloved beauty icons' include the unique and trendy False Eyelashes, Cleansing Oil, Glow on Blush, Eyelash Curler and Drawing Pencils. Shu Uemura UV Under Base Mousse is used as a primer to effectively 'fill-in' pores to reduce the appearance of large pores. It can be worn alone or beneath makeup. The product is a foam/mousse which is dispensed through a pump and looks just like whipped cream...only slightly beige in colour! This UV Under Base Mousse can be purchased in either pink or beige. I love how lightweight this product feels on my skin and it absorbs quickly as well. This primer has SPF10 and is discontinued, because a new formula has been produced with higher SPF (SPF30). I was told both primers, new and old, contain the same ingredients, however, the newer formula contains higher levels of Zinc Oxide, hence the higher SPF of 30. I haven't used Shu Uemura's UV Under Base Mousse before and couldn't decide which one to get. I was told the new formula is slightly drying due to the additional levels of Zinc Oxide. So, I decided to try the discontinued UV Under Base Mousse with SPF10. I think this primer is perfect for winter with that little bit of SPF to keep my skin protected. This gorgeous looking Satin Radiant Stick was released in early 2010 as part of the Spring 2010 collection, which was inspired by the theme of Rock 'n' Roll. 'Flashy, glimmering shine is complemented with delicate satin-sheen finishes to transport you to the spotlight of the captivating rock stage'- Égérie. When I saw the pretty silver, pink and white design on the case of this highlighting stick, I was immediately attracted! This highlighter actually reminds me of the famous NARS multiples! Just twist the base up and down and it's ready to use. I love the creamy satin texture of this highlighter which contains miniscule shimmers/pearl. I love how versatile this highlighter is as it can be used to highlight the brow bone, illuminate the cheeks or even add shimmer to eyeshadow. This product contains dimethicone, a non-comedogenic ingredient (i.e. does not clog pores), which is a silicone based organic polymer that enables the formula to apply on ultra smoothly to provide a soft and velvety touch to the skin. When applying this highlighter you need to blend it with a brush or your fingers (I use my fingers), so that it appears translucent and shimmery. Otherwise, you'll end up with a thick shiny opaque silver stroke on your skin. I've heard of so many rave reviews on Shu Uemura's Face Architect foundation range, so I'm glad that I purchased the cream foundation and powder at a fraction of the RRP. Face Architect Remodeling Cream Foundation provides high coverage with a dewy finish and Powder Foundation Natural Glow Finish provides sheer coverage. In my opinion, these complimentary foundations are suitable for the cooler season, since my skin looks a little dry during winter and needs a little glow. I'll see how I ago after using this foundation for a few more days and will let you all about it in more detail. At first, the Shu Uemura shading system was just totally confusing that I couldn't figure out which shade suited my skintone. Thanks to the lovely Shu Uemura representative I spoke to, I finally understand how their colour chart system works. Each shade is assigned a three digit code and the initial number denotes the undertone. The next two digits denotes the intensity of your skintone. For example, #764 and #774 are both warm yellow undertones, however, the latter is lighter by one level. This Shu Uemura powder foundation compact case is nice and sleek and is available in black or white. It has an inbuilt mirror and comes with a sponge applicator. 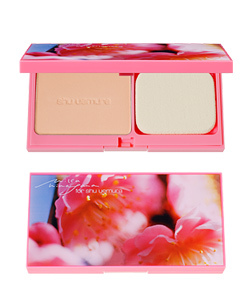 The Shu Uemura Sakura Collection has already launched in Australia and there is a special edition powder foundation case (by Mika Ninagawa) ($35) that you could purchase to add some blossom to your makeup collection. I purchased the black case, because it looks sophisticated and stylish. I purchased this case for $25, which I think is quite pricey as it's only sold alone and not together with the powder. 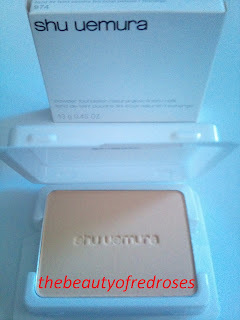 It would have been good if the compact was sold together with the powder like most other brands I have purchased from. Shu Uemura's High Performance balancing cleansing oil is a 3 in 1 cleansing oil which works as a cleanser, make-up remover and eye make-up remover. This cleansing oil is highly rated and definitely one of the best cleansing oils on the market. This cleansing oil is super easy to use. Just pour/pump a small amount into the palm of your hands, spread thoroughly on your dry face, add lukewarm water to your face to emulsify the cleansing oil until it turns milky and then rinse your face thoroughly. This cleansing oil leaves my skin feeling clean, soft, balanced and doesn't leave an oily layer on my skin. It effectively removes all traces of makeup, as what I've learnt in Chemistry class, 'like attracts like'. Hence, the ease of removing oil-based makeup (most makeup is oil based) by using a cleansing oil. Which Shu Uemura product/s do you LOVE? Are you heading down to David Jones to check out their amazing half yearly clearance sale? How much did you get the Shu highlighter for, if you don't mind me asking? Shu Uemura is such a pretty brand, I have one of their makeup palettes and it's so gorgeous, I'd love to get more Shu in my life! I purchased the highlighter for $45.50. There were only a couple or so of these highlighters left, which were hidden under a pile of Shu Uemura eyeshadows and lipsticks. There were also one of each pink glow on blush and silver and gold drawing pencils, though I didn't purchase these as I already have something similar. It was tempting though!